This is a very unusual children’s book, and I hesitated for a while before reviewing it, trying to decide how I liked it. While it was written recently, it reads as if it is from another time altogether. It weaves the magical and unreality in a way that you begin to feel you are reading an old-fashioned fairy tale, which in some ways it is. I cannot quite categorize the children’s book at all, so I decided to review it, and leave it up to you. It does seem to be a very Waldorf-aligned early reader or read-aloud. 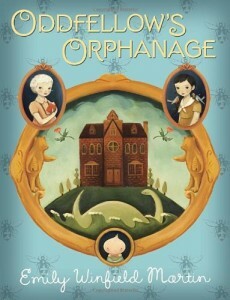 The setting is completely unreal – an orphanage of a variety of children, animals, and other odd creatures, abandoned or otherwise separated from parents. Once you get comfortable with the setting, each chapter is a small adventure of its own about the inhabitants, giving us a look at their main quality, whether courage, compassion, or creativity. I could see each chapter being read as a bedtime story of its own. The whole thread of the story is kindness and friendship. To go along with the old-fashioned language and content of the story, the version I read of this children’s book was crafted in sepia, with small sepia illustrations throughout. In the back notes, it also explains that the characters and title of the children’s book actually are derived from the order of Oddfellows, which in fact in its early days, took care of widows and orphans. I would say the book is worth reading with younger children, who are looking for something simple, other-worldly, and almost sugary sweet. This children’s book meets all those criteria. Postscript: I’ve waited almost a year before posting this review, and decided to look once again at why I hesitated. I went to see more about the author, and everything became clear, as I realized she is first and foremost a creative and imaginative illustrator, and the children’s book is just one of the many ways she expresses her art. Here is the website for the book and here is her own website, pointed to other children’s books she has created, which seem worth checking out.